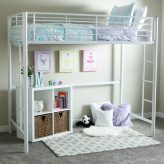 When you are shopping for a bed for kids, consider purchasing metal loft beds. Loft beds are perfect in small rooms where space is limited. Teens love to sleep elevated and use the space below the loft for relaxing or studying. At its simplest, a bed loft gives only the elevated sleeping space but a twin loft bed with desk gives elevated sleeping space with built in studying space directly below the bed. 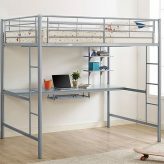 A metal loft bed with desk is usually less expensive than the wood loft beds but they are still a viable alternative. They often have a basic, simple style that won’t conflict with your decor. You will find a black loft bed, a white loft bed with a desk, a silver loft bed with workstation and more at bunkbedsbunker.com. 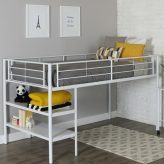 Whether it’s bed lofts for college, youth loft beds, or a kids loft bed with desk, an affordable loft bed may be the best choice for your family. Our metal loft beds with desk optimize room space by providing elevated sleeping yet plenty of desk space below. 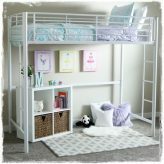 The sturdy frames are easier to move than wood loft beds, they are easy to assemble, and they are easy on the pocketbook. Many folks are looking for cheap loft beds but we caution you to buy good quality loft beds on sale. Any cheap version of and elevated bed could be a safety hazard. So we don’t sell cheap products. We try to offer good products at a reasonable price and we will try to price match if possible. Our metal frame beds come in white, black and silver finishes. 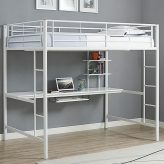 They come as a basic, no frills loft bed or with a desk making them a sleep and study loft bed. It’s the perfect room sharing bed for teens or college students. All your sleep and study needs fit neatly in the dimensions of a twin loft bed. So whether you need kids metal loft beds or teenage loft beds, we have plenty of loft beds for sale! 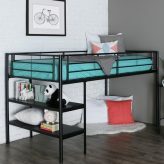 Our economical metal beds make the perfect loft beds for teens, or dorm and college loft beds.